You may be doing a Systematic Review as part of postgraduate study, to help with a grant proposal or as part of a larger research bid. Whether you are a complete novice or an old hand, asking librarians to guide and advise will save you time and energy in the long run. Systematic Reviews are often conducted in the fields of health, psychology or education; the increase in cross disciplinary research may find other fields are also involved. As librarians we can help with Steps 2, 3 and 5. We can also suggest resources to help with the other steps. 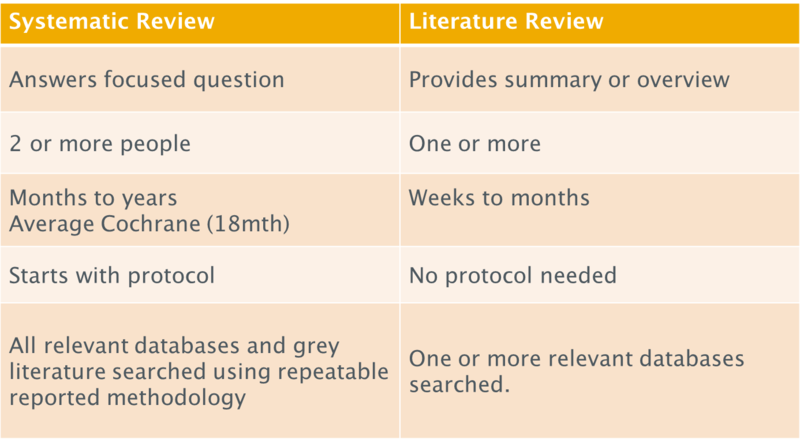 Not sure if you are doing a systematic review or a literature search in a systematic way? There is fine line between them but generally if you are an undergraduate you will be doing the latter. If you need help please contact your relevant Academic Engagement Librarian by finding the relevant subject guide and following the relevant email link or drop in to the Academic Skills Hub. The Cochrance Library is known as the home the Cochrane Reviews, the "gold standard" systematic reviews in healthcare interventions. But it also contains information about other systematic reviews, randomised controlled trials, economic evaluations and health technology assessments. The JBI Database of Systematic Reviews and Implementation Reports is a refereed, online journal that publishes systematic review protocols and systematic reviews of healthcare research following the JBI methodology and undertaken by the Joanna Briggs Institute and its international collaborating centres and groups. These reviews may be of quantitative or qualitative research data, text and/or opinion, relate to economic data or combinations of the above. The JBI Database of Systematic Reviews and Implementation Reports is published in annual volumes. Each volume has monthly issues. Prospero is an international database of prospectively registered systematic reviews in health and social care, welfare, public health, education, crime, justice, and international development, where there is a health related outcome. Key features from the review protocol are recorded and maintained as a permanent record. PROSPERO aims to provide a comprehensive listing of systematic reviews registered at inception to help avoid duplication and reduce opportunity for reporting bias by enabling comparison completed review with what was planned in the protocol. The Southampton Statistical Sciences Research Institute (S3RI) offer courses on Medical Statistics & Modelling- including Meta analysis, Design of Experiments and Survey & Official Statistics. SHTAC offer the above course covering the key stages of a systematic review, from scoping the research questions to disseminating results and recommendations. The course is designed for health professionals, academics and decision makers with an understanding of health and related search. ScHARR offer a 3 day short course on Systematic Reviews and Meta-analysis.